Mount Zion Cemetery, adjacent to the church, contains more than 200 graves. While most of these graves are unmarked, the oldest marker is from 1861. By the end of the Revolutionary War, many Quakers and anti-slavery sympathizers had set aside land for freed slaves. African-American hamlets were established in secluded areas on portions of Quaker land throughout western New Jersey. Small Gloucester, also known as Dutchtown, emerged in the early 19th century as one of these African-American settlements. One well-known Underground Railroad route was the Greenwich Line that began in the hamlet of Springtown, led 25 miles north to Small Gloucester, and continued north to Mount Holly, Burlington and Jersey City, New Jersey. The communities along this route were ideal stations on the Underground Railroad as they were situated about 20 miles apart, surrounded by Quaker land which was often swampy or dense woods, and inhabited by many free African-Americans. For more than 10 years, Harriet Tubman helped operate this line. 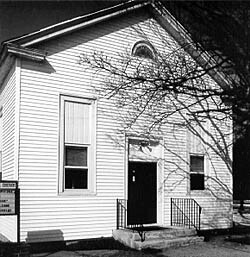 The Mount Zion African Methodist Episcopal (AME) Church, a small one-story frame church built in 1834, was one of the important Underground Railroad stations in Small Gloucester from the time of its construction until the beginning of the Civil War. Members of the Mt. Zion AME church supported the Underground Railroad and actively provided protection, supplies and shelter for runaway slaves. The church was always a safe haven, and several original members of the congregation, including Pompey Lewis and Jubilee Sharper, directed conductors, engineers and slaves north after taking care of their personal needs. A secret, three foot by four foot trap door in the floor of the church's vestibule provided access to a hiding place in the crawlspace under the floor. The AME Church was organized nationally in 1816 under the leadership of Richard Allen, a very successful African-American circuit preacher. Allen and all AME circuit preachers played an important role in the protection and movement of runaway slaves as they moved through counties and conveyed directions, relayed messages and provided shelter. 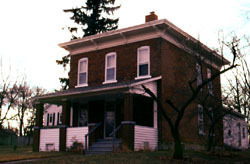 Mount Zion African Methodist Episcopal Church and Mount Zion Cemetery is located at 172 Garwin Rd. in Woolwich Township, New Jersey. It is still in use by the congregation. Visit their website for further information.